Nearly seven years ago, Constable Joanna Wright received a call from Toronto East General Hospital, now Michael Garron Hospital (MGH), about an elderly woman who was constantly being treated by their mental health team. The name rang a bell with the 54 Division officer. While meeting with the elderly woman and a member of the hospital’s psychiatric unit, the son showed up. An investigation was launched that led police to the home where they recovered an arsenal of weapons and bomb-making material and charged accordingly. Wright is convinced that a more serious incident was averted because of the partnership between police and the hospital on this case. “The hospital was able to keep her a little longer so we could make sure the residence was safe for her to return and the police did a little extra work to ensure this woman’s safety,” said Wright. On January 14 this year, the veteran officer was the recipient of the MGH inaugural Community Partner of Distinction Award. In the last decade, Wright has worked closely with the hospital’s emergency department to help reduce wait times, collaborated with hospital units to address safety and security concerns and helped patients and staff take part in workplace violence prevention training sessions and programs aimed at identifying signs of domestic abuse. Wright’s professional, kind and compassionate approach made it easy for hospital staff to respect her. “She’s a household name in the hospital community and our ‘phone a friend’ for the last 10 years,” said Janice Ward, the manager of Quality & Safety. Wright has also worked closely with the hospital social workers over the years. “Not only is Joanna reliable, dependable and prompt, but she’s an invaluable resource when it comes to providing information and following up in the community with our most complex and challenging patients,” noted MGH social worker Alina Mustata. Joining the Service straight out of high school 30 years ago, Wright spent 17 years at 33 Division before being transferred to 53 Division where she worked in schools. She has been at 54 Division, which recently merged with 55 Division, for the past 10 years. Working with hospital leaders to help establish a Mobile Crisis Intervention Team (MCIT) in East Toronto in 2013 is one of the highlights of her professional career. MCIT teams respond to calls involving people in mental health crises, including thoughts of suicide or self-harm threats, distorted or psychotic thinking, and anxiety, overwhelming depression and temporary breakdowns. The officer and the nurse assess an individual's specific needs, provide intervention and support at the scene, de-escalate the situation and ensure the person is connected to appropriate services. The MCIT provides a secondary response to 9-1-1 calls involving people experiencing a psychiatric or emotional crisis that requires intervention. 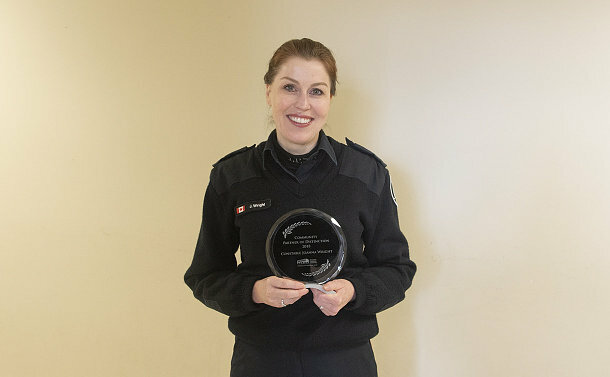 Wright is a member of her station’s Community Investigative Support Unit established in each Division as part of the modernization plan to manage lower priority calls for service.